Although it may be colder and wetter than during the peak tourism months of summer, Copenhagen has plenty to offer in the winter as well. Try some of these activities and events to make the most of your time in this beautiful city, no matter the season. Copenhagen has multiple outdoor skating rinks that offer great ice skating and excellent scenery. The ice rink at Frederiksberg Runddel is free and open each day in December. Bring your own skates or rent a pair there until an hour before closing. Situated by the entrance of the Frederiksberg Gardens, this rink provides a lovely setting as you warm yourself up with a little brisk activity. Just be sure to skate counter-clockwise to avoid any crashes. 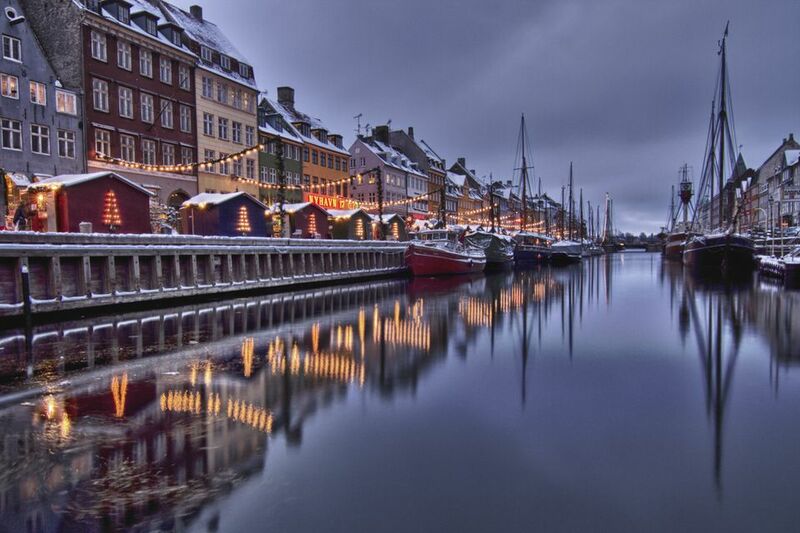 Starting in November, Christmas markets pop up all over Denmark. These charming and atmospheric markets are the perfect place to find souvenirs and gifts or to do a little window shopping while sipping on a cup of mulled wine. The Christmas market at Tivoli Gardens, a 19th-century amusement park in the heart of Copenhagen, is especially not to be missed. Enjoy the rides during the day and then stick around for the dazzling light displays after dark. For a different sort of ambiance, check out the Christiania Christmas Market. Founded in 1971 when nearby residents took over an abandoned military area, Christiania is an autonomous commune with collectivist and anarchist roots. The indoor Christmas market at Christiania offers many shops with unique gifts and delicious snacks. If you're planning to ring in the new year in Copenhagen, there will be plenty of festivities to enjoy. From December 26th to the 30th, the Tivoli Fireworks Festival lights up the sky every night with fantastic fireworks displays centered around a different theme each year. On New Year's Eve, head out on the town to enjoy one of the special dinner menus offered by many restaurants, or try drink specials and cocktails later in the evening as the bars and clubs go all out. Finally, gather together with the crowds at the Town Hall Square just before midnight to count down to the new year and hear the clock tower chime. When it's too cold or damp to stay outside, get warm and toasty as you explore one of Copenhagen's numerous museums. The Hirschsprung Collection has a large assortment of paintings from Danish artists of the 18th and 19th centuries. Just down the road is the National Gallery of Denmark, which holds nearly 9,000 paintings and sculptures (and admission to the permanent collection is free). If modern art is more your style, try the Den Frie Centre of Contemporary Art or the ARKEN Museum of Modern Art, located in a nearby suburb just outside of Copenhagen. If you prefer something a little more offbeat, check out the Medicinsk-Historisk Museum and its collection of fascinating artifacts from medical history, or explore The Cisterns, a subterranean museum of modern glass art.